I've been wanting to make this ever since my friend's very French boyfriend sent me this video. I'm still not sure what it has to do with Louis Vuitton but it's an adorable short on French pastries and how they came about. 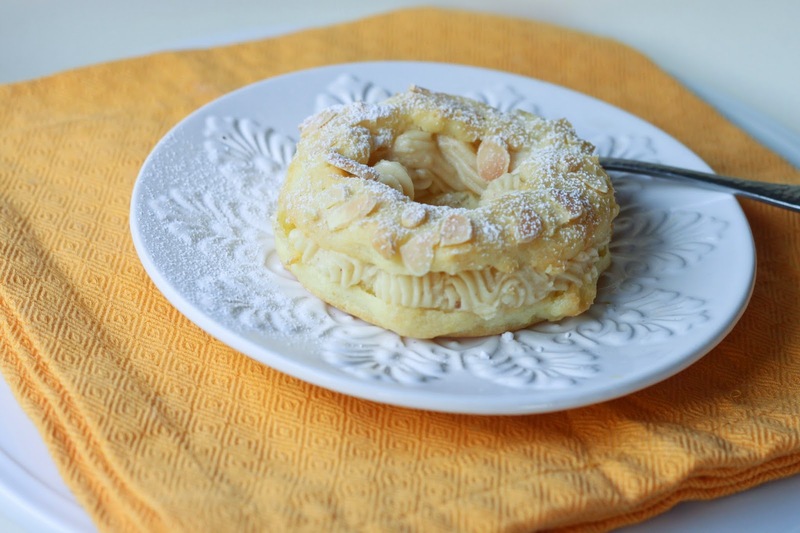 I love the look of the Paris-Brest: choux pastry dough (what's used for cream puffs and eclairs) piped out in rings, topped with almonds and filled with a mousseline pastry cream, often praline-based. I had a lot of time last week, what with the crazy weather in the triple digits and a day off from the market. I decided to take this time to try out recipes from my Laduree cookbook. I wanted to make puff pastry but then read about how they're ideal in colder temperatures, so that idea was out. I've mentioned before that I've never been a big fan of cream puffs/profiteroles, mainly because they're not sweet enough for my taste. That's all changed now with this hazelnut praline pastry cream. I've had hazelnuts in my pantry for a while now, but was saving them...for absolutely no reason. So when I saw that this recipe asked for hazelnut praline paste, I decided I didn't want to go buy it when I had so many hazelnuts on hand. I found an ideal recipe for making the paste from scratch and went for it. It was surprisingly easy, despite home-cooked caramel being involved. The step-by-step tutorial was very helpful and encouraging, although I think I will stick to buying skinned hazelnuts from now on, wherever they're available. The praline paste is to die for. I could literally just eat it out of a jar. If you add chocolate to it, it's essentially Nutella. I made a mousseline cream and incorporated the praline paste, which just took it to another level. It also added just the perfect amount of sweetness that I had felt was missing from cream puffs in general. I had plenty left of mousseline cream left over from the Paris-Brest to make some cream puffs, and also to make some cupcakes (another post to be coming soon). As for the left over paste... I smeared it on some toast with sliced strawberries. Heaven. Stir the butter and water in a saucepan over medium heat until the butter is completely melted. Remove from heat and stir the flour into the pan. Stir vigorously until the batter comes together and starts to pull away from the sides. Once it's cohesive and slightly cooled, add in eggs one at a time, stirring after each time. Once all combined, pour into piping bags with a round tip. On a baking sheet lined with parchment paper or silpat mats, pipe rings leaving some space in between (size is up to you, I made about 8 rings). Sprinkle sliced almonds on top. When ready to bake, place pan in oven and lower heat to 350 degrees F and bake for 30-35 minutes. Once done let cool completely and then slice horizontally. Fill with pastry cream and set the other half on top. Sprinkle sifted powdered sugar on top and serve. 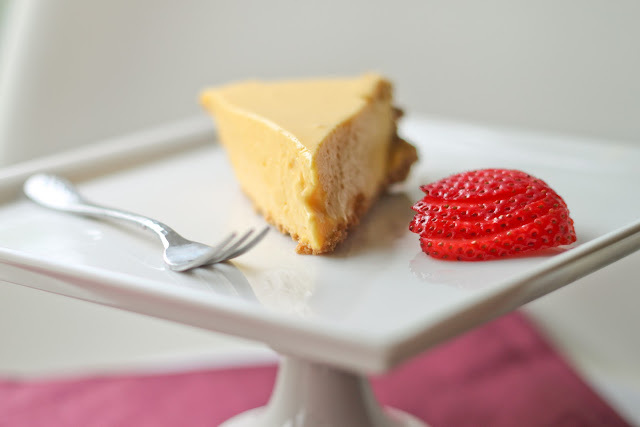 Great photo tutorial and recipe here! Bring the milk to a simmer in a saucepan. In a large bowl, whisk the egg yolks and sugar until slightly pale. Add in the cornstarch. Pour a third of the hot milk over the mixture while whisking. Whisk until combined and then pour the whole mixture back into the saucepan. Bring to a boil while stirring with a whisk, over medium heat. Watch carefully so as not to cook your yolks! It should slightly thicken. Remove from heat and allow to cool for 10 minutes so that it's hot but not boiling. Incorporate half of the butter until combined. Pour into a baking dish, cover with plastic wrap, and let cool. Once it's room temperature, whip with an electric mixer until smooth. Add in the praline paste and the remaining butter. Hi, your treat turned out so pretty--it made me try the recipe. Although the pastry turned out perfect, my mousseline is a little soft--any thoughts on what went wrong or how I can firm it up to be pipeable? @anonymous, hm, I just beat the cream for a very long time until it became more stable. Once you add the softened butter and beat for a while, it should come together nicely. It will always be a little soft/creamy, but it shouldn't be thin, for sure. I would recommend beating it long, or adding a little more butter to it!